The former Brazilian Environment Minister, Marina Silva, is expected to be named in the next few days to run for president in October. She would replace former presidential candidate, Eduardo Campos, who was killed in a plane crash on Wednesday. 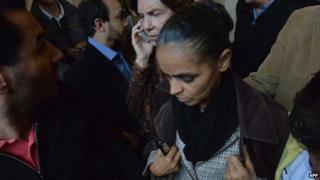 A close adviser to Ms Silva, Bazileu Margarido, told the BBC that she had agreed to run. But the decision still needs to be officially approved by Mr Campos's Socialist Party (PSB). The Socialists - the major partner in the opposition coalition established to run against President Dilma Rousseff - are expected to announce their decision after a meeting on Wednesday. Ms Silva had decided to run for vice-president alongside Mr Campos after the Electoral Court in October 2013 refused to register her political movement, Rede Sustentabilidade (The Sustainability Network). She fell out with the Workers' Party government and left office to run against Ms Rousseff in 2010. An environmentalist and devout evangelical, Ms Silva polled surprisingly well, coming third with nearly 20% of the vote. Ms Rousseff, who is running for re-election in October, is the front-runner. On Sunday, the first opinion polls showing Ms Silva as candidate will be published in Brazil. The first round of the presidential election will take place on 5 October and will go to a second round later that month if no candidate receives more than 50% of the votes. The other main candidate is Aecio Neves, a current senator who will represent the Brazilian Social Democracy Party (PSDB). Ms Silva is seen as a strong opponent and one who may win over even more support than Mr Campos would have, says the BBC's Julia Carneiro in Rio de Janeiro. She avoided addressing the issue as she travelled to Mr Campos's funeral. "I have a sense of responsibility and commitment," she told journalists as she arrived in the north-eastern city of Recife. Tens of thousands of people are expected to gather in the streets of the city on Sunday to pay their last respects to the popular politician. Mr Campos, 49, came from a traditional family of politicians and was governor of Pernambuco for seven years, leaving office earlier this year with high approval rates. His private jet - a Cessna 560XL - crashed in bad weather in the port city of Santos, in Sao Paulo state. It was travelling from Rio de Janeiro to the seaside resort of Guaruja. An investigation into the causes of the crash, which killed Mr Campos and six others, is under way. The black box recovered from the wreckage of the plane did not record his flight, Brazilian Air Force (FAB) said.